Justify — 2018’s Kentucky Derby and Preakness Stakes winner — has already made horse racing history. Now he’s 1.5 miles away from becoming an industry legend. The three-year-old colt is on a roll. 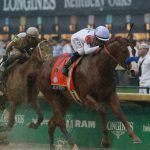 He bested the field at a muddy and slippery Kentucky Derby before hanging on by a nose to take the Preakness Stakes just two weeks later. Now the third leg of the Triple Crown — the Belmont Stakes — looms. 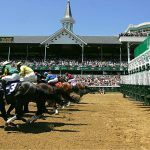 The thoroughbred is in position to lock down his place in horse racing lore by becoming the 13th horse to win the most coveted prize in the sport. 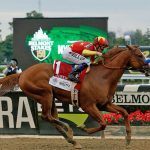 Bookmakers have Justify as a big favorite to complete the feat when the 150th running of the Belmont Stakes gets underway this Saturday on Long Island. Win or lose, Justify has already put himself among the all-time greats. The Bob Baffert-trained horse is something of a prodigy, having made his first-ever start this February, a race he won. Justify never competed as a two-year old, making him the first such inexperienced winner of the Kentucky Derby since Apollo in 1882. He’s entered five races and has yet to lose. But that also means that Justify is no longer catching anyone by surprise. Most sports books have installed him as an even-money favorite for the Belmont Stakes, well ahead of the rest of the field. In fact, many outlets are paying less than even-money odds, with Paddy Power and Betfair both paying out 8/11 on a Justify victory. However, if history is any indication, he might be less than even money to win. 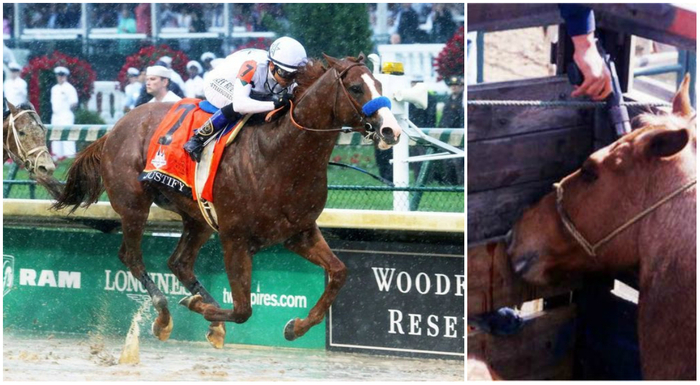 Thirty-five horses have won the first two legs of the Triple Crown, and only 12 have gone on to win the final race. Meanwhile, Gronkowski — who is co-owned by NFL star Rob Gronkowski — will land you $25 on a $1 bet if he pulls off the upset. The biggest longshot in the race is Free Drop Billy at 40/1. But horse racing is not all big-money purses, fancy hats, and mint juleps. While the sport has been part of the American fabric for 150 years — and with more than 10 million viewers expected to watch Belmont this weekend — others are focusing on an uglier and more hidden side of the industry. According to both the Humane Society of the United States (HSUS) and the ASPCA, more than 75,000 horses were shipped to Canada and Mexico in 2017 to be slaughtered. Both animal welfare organizations say horses face brutal conditions in their final days, claiming that some of them are still alive when they’re skinned and dismembered, and are then butchered and sold for consumption across the globe. And yes, that will most likely include several of the competitors in this year’s Belmont Stakes who won’t be fast enough to cross the finish line first. Even winners aren’t immune to the slaughterhouse. Ferdinand — the winner of the 1986 Kentucky Derby — was shipped off and killed after failing to father winning foals. Both HSUS and the ASPCA says things are very slowly improving, though there’s still a long way to go. Data from between 2012 and 2016 showed an annual average of 137,000 American horses being shipped to foreign slaughternouses, often enduring (as they still do) shipment in tightly packed, near-airless quarters with no food or water, only to meet a gruesome and often prolonged death once they arrive at their final destination. ASPCA wants the practice of foreign slaughter of American horses to be banned via Congressional action, and helped author the Safeguard American Food Exports (SAFE) Act (H.R. 113/S. 1706), which was introduced in 2017 to both the US House and Senate. The act — which would both ensure that horses couldn’t be exported for slaughter and prevent the re-establishment of any American slaughterhouses for the same purpose — has bipartisan support, according to the ASPCA, but still needs citizens to contact their representatives and senators to see through its Congressional passage.